This week we wanted to share with you our CSA prep routine. It took us a while to figure this out. At pick-up we bring a few large reusable grocery bags, and a bunch of small white plastic ones to sort our greens and keeps the larger bags cleaner and drier. We used to just stick the white bags in the fridge, but you can’t see what you have. In the summer we like to be outside working in our yard, or going for walks, or see friends and family. Life gets busy, and while our intentions might be to make a beautiful salad, it can be hard to be inspired and make it happen when all of our beautiful produce in hidden in white plastic bags. What works best for us to treat CSA pick-up as a date. When we get home, now we unpack everything. We work together washing all the greens, spinning, chopping them or de-stemming them, and sorting them in large glass and clear plastic containers. We have one for kale, spinach, bok choy, lettuce, and a salad mix (lettuce, spinach and salad greens.) We can see everything, and making a salad is super quick and easy. 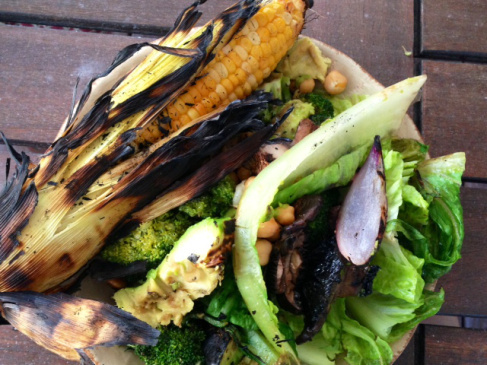 * One exception: we have a killer recipe for a grilled romaine salad. If you want to make that this week, don’t wash and chop that yet. It also makes it really convenient to throw some greens in a smoothie for extra nutrition, which brings us to our first recipe. There are lots of ways to make these. Here’s the one I made for us today after a long walk with our dog this morning. This serves two people. The measurements aren’t exact, I just estimate. I juiced some carrots this winter and frozen then into ice cubes. 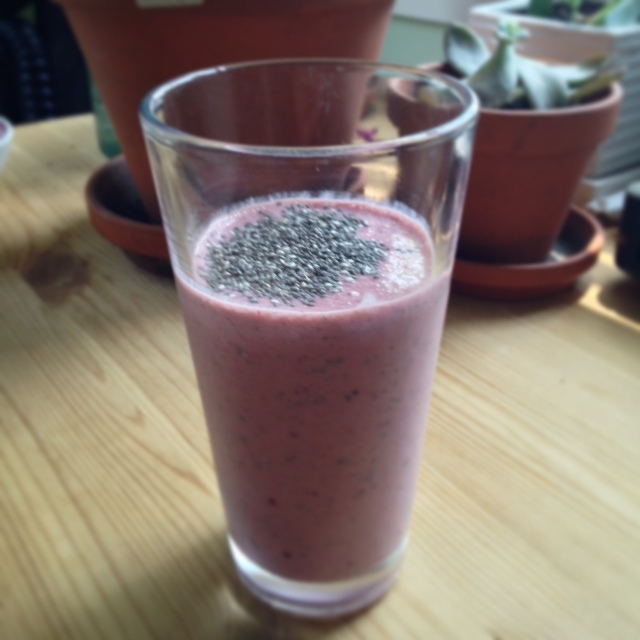 I threw a few of those into the blender. If you’re using fresh fruit instead of frozen, you’ll want to use some ice cubes. I also added a little bit of water because it was really thick and that helped it blend much better. This makes a great breakfast, snack, or even a mildly sweet dessert. Blend the lime juice, oil, cilantro, garlic, honey, salt and pepper. 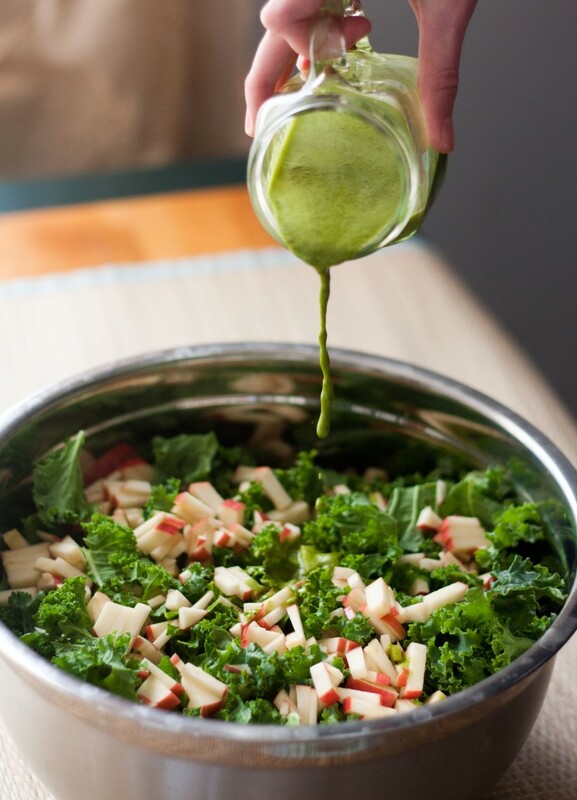 In a large bowl, mix the kale and apples. Peel the kohlrabi (with a vegetable peeler) until the tough outer layer has been removed. Slice into 1/4″ thick slices. Enjoy with thin slices of your favorite cheese on top. We think white cheddar pairs well. What a great snack. This recipes calls for 4 kohlrabi. You could make a smaller batch, or supplement with chopped potatoes. These are basically kohlrabi fries. If you cut them into smaller pieces, roasted kohlrabi would also be a delicious addition to a salad. Check out a recipe here. Slice the Kohlrabi into 1/4″ thick pieces and cut in half. Toss in a bowl with the oil, clove, salt and pepper to coat evenly. 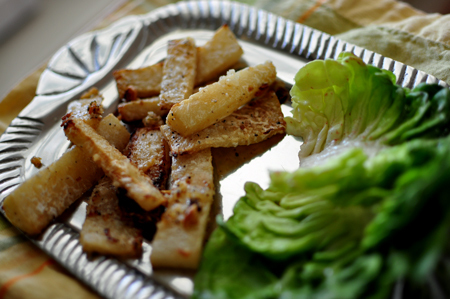 Spread evenly on a baking tray for crispy kohlrabi, or in a glass baking dish for softer results. Bake 15-20 minutes, until browned, stirring occasionally to keep them from getting too crispy/burnt. Sprinkle with parmesan cheese and bake about another 5 minutes. Saute the onion and garlic with the oil in a pan, until slightly caramelized. Add chopped spinach to a large bowl. Add salt, pepper flakes, cheese, eggs, and sauteed onion and garlic. Mix well. Add the bread crumbs. The mixture should start to thicken up. The eggs will help to keep the form when you start cooking as well. Add a small amount of oil to a frying pan and medium heat. 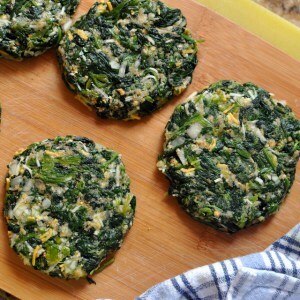 Divide the mixture and form into five patties and place them in the pan. Cook the burgers for 3 minutes on each side, twice, until the golden and crispy on the outside. Serve warm. If you are planning to make this – DO NOT WASH AND CHOP THE LETTUCE AS SUGGESTED ABOVE. You’re going to want to grill that whole head of lettuce. 2 portobello mushrooms, or a handful or bay bellas, button, etc. Heat your grill over medium. Cut the romaine in half, lengthwise. Wash and dry the leaves, being careful not to break them from the stem. In a bowl, toss the the broccoli with a drizzle of oilive oil and sprinkle of salt and pepper. Toss to coat. Spread on a grill pan with chickpeas. Grill for about 5-10 minutes, stirring a few times. The broccoli should be lightly charred, tender yet crisp. While broccoli and chickpeas are cooking, lightly oil, salt and pepper the avocado, onion, and mushrooms. Grill the onion for about 3-4 minutes per side as well as the mushrooms. Remove from the heat and turn your grill down slightly around 300-325* F or just under medium. Place avocado on the grill, cut side down and grill for about 3 minutes – you will see grill marks. Brush the romaine lettuce with a light coating of oil. Grill with cut side down for about 2 minutes, flip, and grill another 1-2 minutes, until slightly wilted and grill marks appear on both sides. Serve as is, or chop the lettuce first. Add a squeeze of lemon juice over the leaves, fresh herbs, parmesan cheese, or chopped nuts. You could add a little more oil and balsamic vinegar for a dressing as well, or use a dressing of your choice. This entry was posted in broccoli, cilantro, garlic, kale, kohlrabi, lettuce, Red Onion, spinach and tagged green smoothie, grilled romaine salad, kale apple salad, kohlrabi and cheese, spinach burgers. Bookmark the permalink.